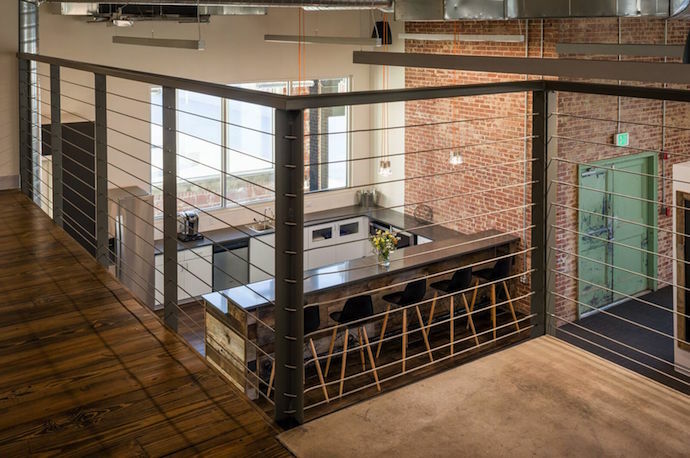 When SecurEdge, a tech startup focused on wireless technology, was looking into opening its first offices, it tapped ai Design Group for the job of transforming two floors of the historic Dyestuff Building in Charlotte, North Carolina into both its offices and the Launch Factory, a co-working incubator. This two-part project involved the full renovation and interior upfit of two office condos. Custom desk and neon sign welcome guests at the entry of SecurEdge, which has views to the workspace behind. Original industrial glass windows separate the low-static repair areas used by technicians from employee workstations. Orange accents play on the company’s vibrant brand palette. Image courtesy of Peter Bretlinger. Approximately 40 people use the space daily. The Launch Factory can host up to 100 additional users. Multiple work spaces and furniture types allow for different modes of working throughout the day in the Launch Factory. Image courtesy of Peter Bretlinger. YES. The Launch Factory specifically is a co-working space that strives to give small startups and/or entrepreneurs a place to launch their businesses, pun intended. SecurEdge has an open plan with private offices for CEO and COO on the first floor, while The Launch Factory has an open plan with enclosed collaboration and meeting spaces. There are numerous. Some are open while some are closed, in a range of sizes. There are break rooms and a lounge area, as well as a tech-servicing area with static-resistant finishes. This is the view from the Launch Factory’s mezzanine to the kitchen. Image courtesy of Peter Bretlinger. The Launch Factory is along Charlotte’s bus route no. 5, with buses running every 20 minutes during peak hours and every 30 minutes druing off-peak hours. The location is also a short ride from the nearest LYNX Light Rail station and about a three-minute drive from Charlotte’s city center. Restaurants, coffee shops and grocery stores are all easily accessible from the space. Plus, there is free parking for building users available onsite. Yes. The co-founder/CEO of SecurEdge engaged closely with our team in the design of the two spaces. The mezzanine is the most unique feature. Carved out of the space, the mezzanine required an unusual structural system to maintain a feeling of openness. Cross-bracing and other structural elements are visible in conference rooms and break-out spaces. The ceiling of the mezzanine is exposed leaving mechanical systems visible and aligning with the building’s industrial history. The design maintains visibility from the mezzanine to the space below as well as to outside. The integrity of the original building remains visible with exposed brick wall and an open ceiling. Large windows let in natural light and views to the outside. Image courtesy of Peter Bretlinger. To incorporate the mezzanine into the double-height space, the design team had to design a unique structural system with exposed structure. Much of the furniture was custom made, specifically the desk systems, which are designed to roll and be reconfigured based on teaming needs. Orange finish details and ductwork through the space plays off the brand palette of parent company, SecurEdge. The parent startup is focused on wifi technologies, so the space is built around wireless connectivity. Conference rooms include videoconferencing capabilities. SecurEdge’s conference room contains a wooden slab table made from recovered lumber. Image courtesy of Peter Bretlinger. Co-working is so much more common nowadays, and I find that exhibition displays at trade shows are in a sense an extension to co-working.